I love salads topped with protein. Be it chicken, salmon, steak, tuna, or even just beans, I love it all! 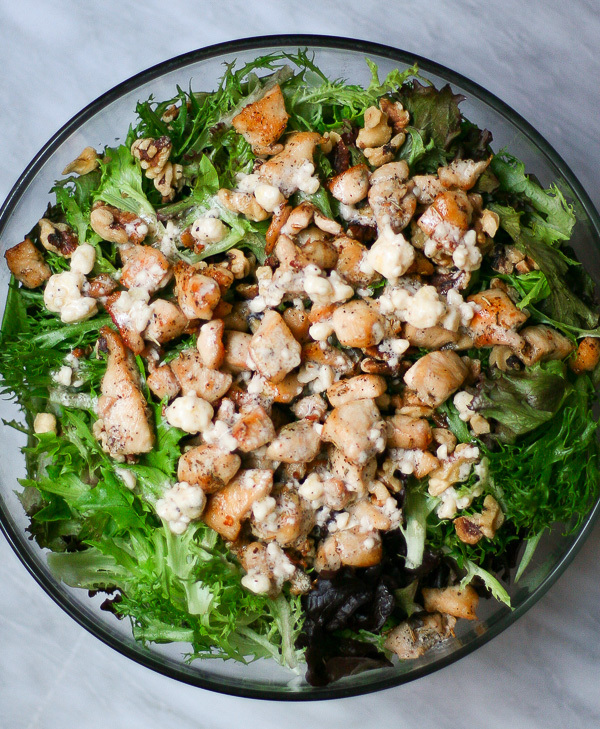 Protein topped salads are one of the most satisfying meals out there. The salad itself loads you up on greens, and all the delicious add-ins help you stock up on fiber-rich fruits, veggies, & nuts. 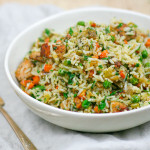 The fats in the cheese and/or dressing help slow the digestion of your meal (keeping you fuller, longer) and boost your absorption of fat soluble vitamins A, D, E, & K.
The protein topper adds some heft to the meal, and leaves you feeling super satisfied, since protein is the most satiating of all the macronutrients. 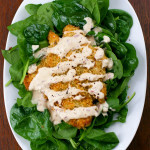 Simply pound your chicken breasts into thin cutlets, dredge in egg & seasoned panko, and pan fry for a few minutes on each side until golden and crispy. Since the chicken is pounded thinly, it cooks evenly & quickly, and has a fabulous ratio of golden crust to juicy moist chicken. It’s seriously one of the best ways to prepare boneless skinless chicken breasts. YUM! 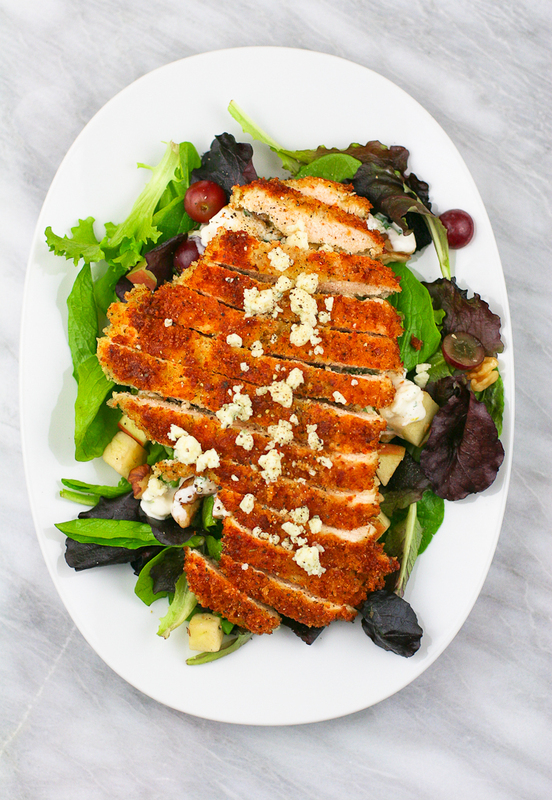 Crispy chicken pieces + grapes + apples + celery + walnut + herbed blue cheese dressing. 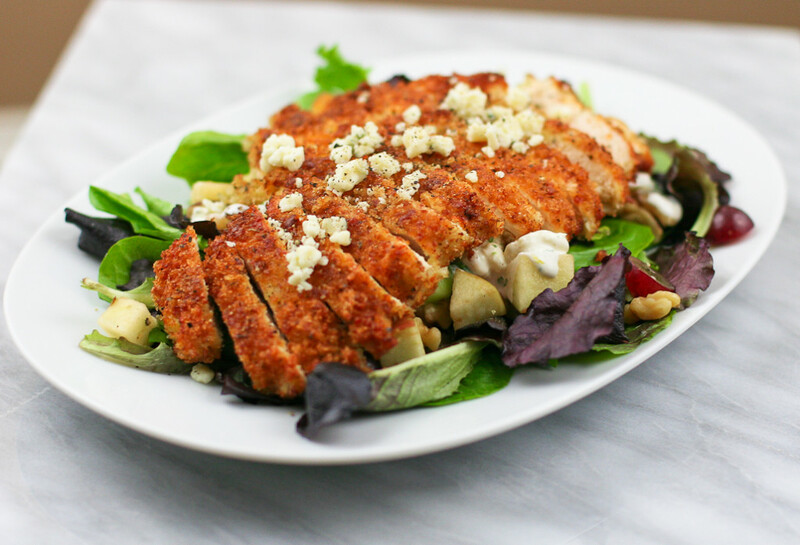 The sweet fresh fruit & crisp celery pair perfectly with moist flavorful chicken and the savory-tang of the blue cheese dressing. This salad is sweet & savory done right. Serve with a slice of grilled baguette or small cup to tomato soup and you’re good to GO. Place the baby greens, celery, apple, and grapes in a large serving bowl & keep cool in the fridge. Add the walnut pieces to a small skillet and toast on medium-low heat, stirring often, until fragrant and golden, just a few minutes. Remove from the skillet and let cool, then add to the salad bowl with the greens, celery, and fruit. Next, make the dressing. In a medium bowl, mix together the red wine vinegar, dijon mustard, gorgonzola, buttermilk, mayonnaise, lemon zest, parsley, chives, garlic, pepper, and salt. When evenly combined, store in the fridge until the salad is ready to assemble. Finally, make the crispy chicken! 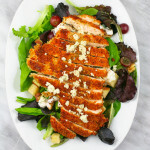 Cut off any extra fat or connective tissue from your chicken breasts, then lay one breast on a large cutting board. Cover with a layer of plastic wrap or waxed paper (to prevent chicken juice splatter), and then pound to 1/4th inch thickness using a meat mallet. If you don’t have one, you can use a heavy bottomed skillet to pound the meat instead. Pound each chicken breast individually, replacing the plastic wrap or waxed paper as needed, and set them aside on a plate. In a medium bowl, beat the 2 eggs until smooth & set aside. On a large plate, mix together the panko, oregano, salt, pepper, and parmesan. Add roughly 1/4th cup olive oil to a large nonstick skillet. Enough to coat the entire pan with a thin layer for pan frying. Place on the stove and heat over medium-high flame. Take 1 chicken breast, dip it into the beaten eggs to coat well on both sides, then lay it on the plated panko mixture. Use your hands to turn the chicken cutlet & pat the breading onto all sides. When the cutlet is well coated with panko, carefully add it to the hot oil in your skillet. While the first chicken cutlet is cooking, repeat the egg-wash & breading process with a second piece of chicken and add it to the hot pan as well. Cook the cutlets 2-3 minutes on each side, until the panko coating is nice and golden and crispy. When the first 2 pieces are done, remove to a plate and set aside. Add a few more tablespoons of oil to the pan (however much is needed to generously re-coat the skillet) and repeat the entire process for the second two chicken breasts. Once the chicken breasts are done, let rest for a few minutes, then thinly slice on the diagonal. 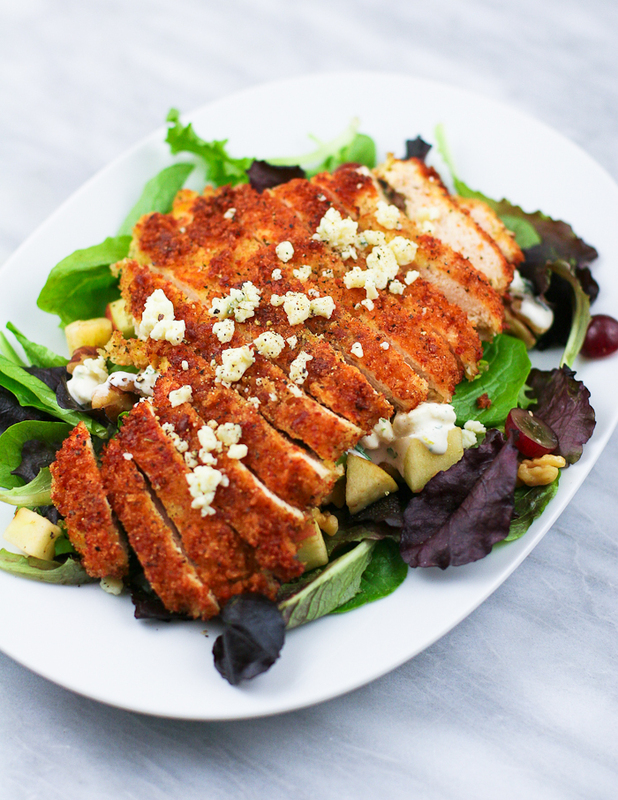 Place 1/4th of the salad mixture into each of 4 large bowls, drizzle generously with dressing, and top with the the crispy chicken pieces. Enjoy right away! Store any extra dressing in the fridge & use for dipping veggies or spooning onto veggie-filled pitas. Leftover chicken pieces make great “chicken-nugget” snacks.